Can we talk about beets for a few minutes?? Please?? I don’t often get to talk about beets because my husband hates them so much that if I even try to bring them up, he basically just says “ew gross” and the conversation is dead. I am so beet conversation deprived. Please send help. However, while on a road trip to Western New York this summer, Chris finally let me listen to a podcast of my choice, after we set through seriously hours of some sort of technical coding podcast (I don’t even know… I fell asleep ). I chose Spilled Milk (my favorite!) and the beets episode at that. Muhahaha he was stuck in a car with me in the middle of nowhere forced to listen to a podcast on beets. The ultimate torture. I actually learned a lot from the Spilled Milk beet episode, like don’t say “beets” with a French accent because it probably doesn’t mean what you think it means (NSFW!). I also spent some time trying to convince my husband that the whole reason he doesn’t like beets is because he probably only really remembers having them from a can. And how he really must try fresh beets because omg they are God’s gift to heaven and he has no idea. Crickets. OK fine. But the most important thing I learned was from the amazing Molly Wizenberg who let me know that beets and cherries are delicious together. At first I thought that sounded kind of weird. And then she mentioned cucumbers and I thought it was even weird. But within about five minutes, I was craving it. So, immediately after returning home from our vacation, I made this salad. Even if you don’t like beets, can you please just admit that they are one of the most stunning vegetables in the world? Cherries aren’t so bad themselves. 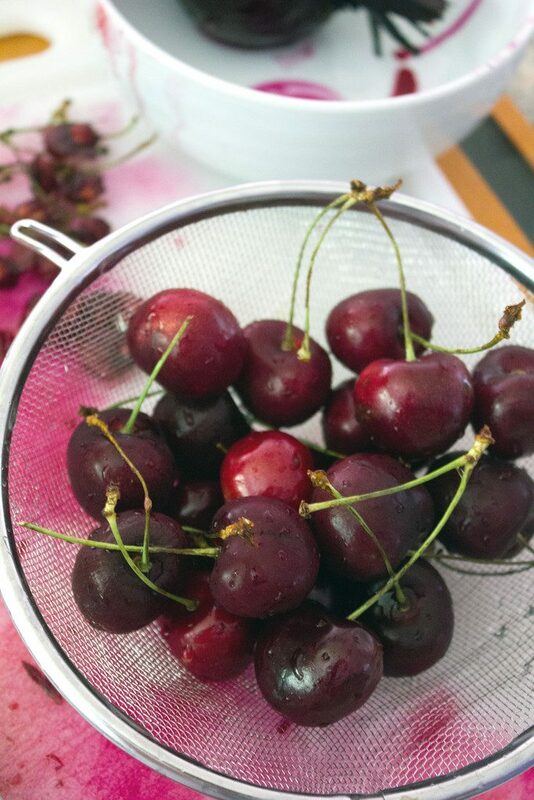 I always regret how few cherries I eat every summer. They are here for such a short, fleeting time! I was going to re-listen to the Spilled Milk episode to determine exactly what Molly recommended in this salad, but then I decided to come up with my own rendition. I obviously included the beets, cherries, and cucumbers… But I also added in some quinoa, feta cheese, and a lime dressing. Instantly, everything in this dish turned red/pink. Such is life with beets. I kind of think that my version of “red” quinoa is way prettier than anything you could buy in the store. 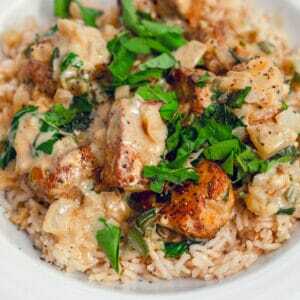 It’s almost impossible to describe the flavors in this dish because there are SO many of them. 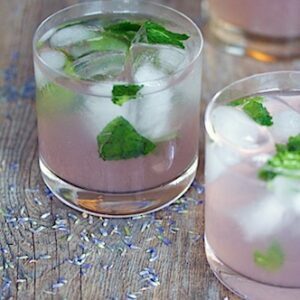 If pressed (because, you know, I have a food blog), I’d go with earthy, sweet, and tangy. All together in one dish. And I don’t have to share because my husband is not interested. I actually did share this since my mom was over my hours and I knew she and my dad are also beet lovers (maybe it’s genetic??). But there was still more than enough for me to take to work with me for lunch the next day. If this salad couldn’t help push my husband over the edge, I’m really not sure what will. He claims that he should be entitled to not liking one food. But I don’t like that idea and don’t understand why he has to pick on the almighty beet. And the roasted beet at that! But really, this might be a battle I have to give up my battle. More beets for me? If you’re feeling skeptical that beets and cherries make an awesome flavor combination, I’m begging you to try this. Or at least listen to the Spilled Milk beets episode and slowly immerse yourself into this wonderful world. 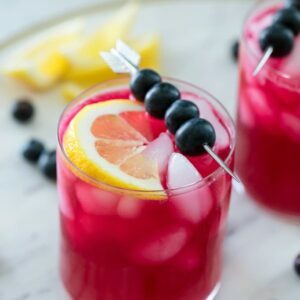 Are you a fan of beets? It seems like the world is pretty set on either loving or hating beets. 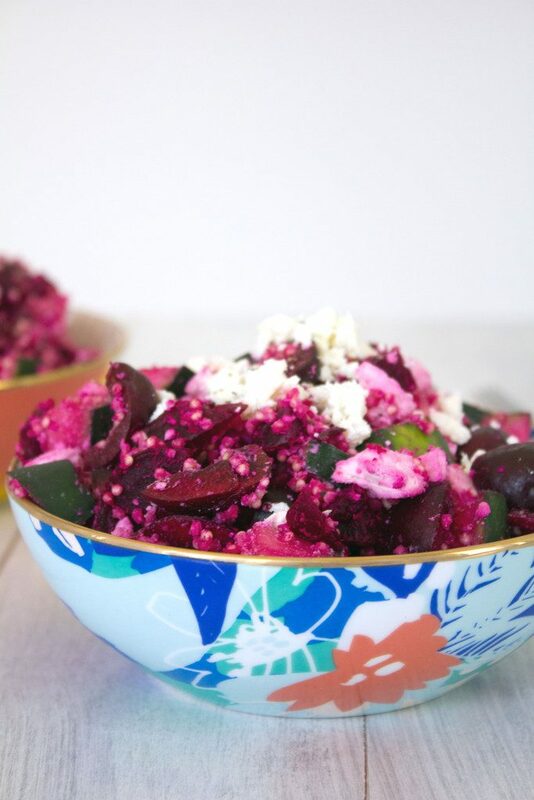 No matter what side of the camp you fall in, you won't likely be able to resist this Roasted Beet and Cherry Salad. Cut off most of the beet root and then wrap each beet loosely in aluminum foil. Place foil-wrapped beets on a baking sheet and place in oven for about 50 minutes, until beets are tender. Be sure to check on them and dribble a small amount of water over them if they appear to be drying out. 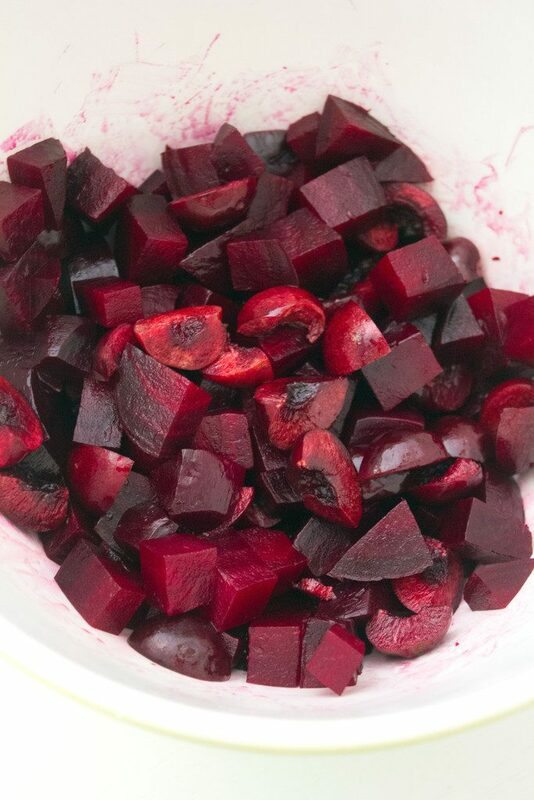 Let beets cool to room temperature and then remove skins. 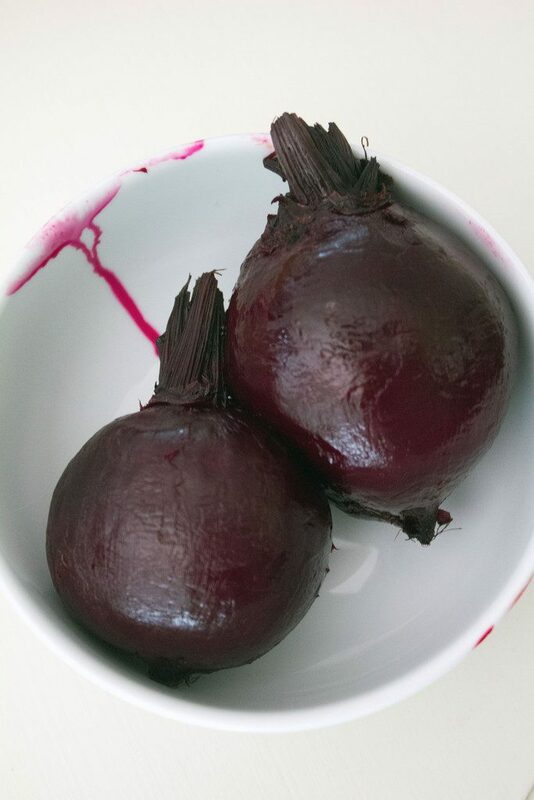 Dice beets and place in a large bowl. 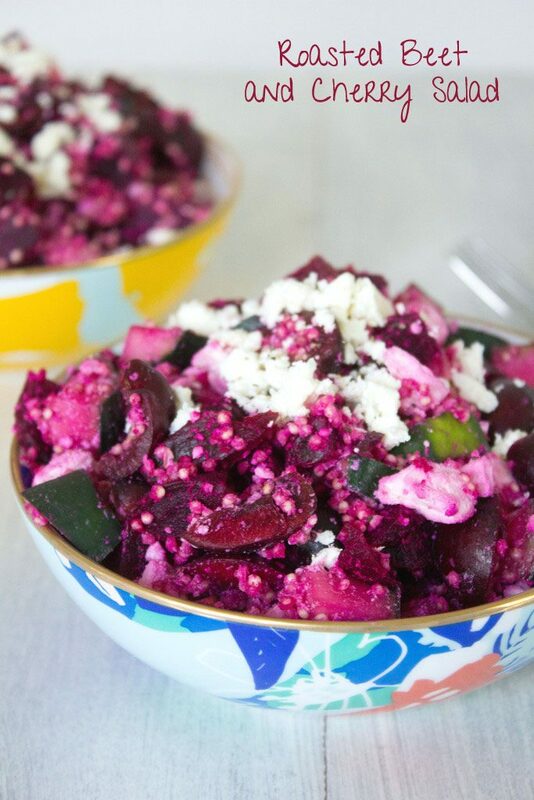 Add cherries, quinoa, diced cucumber, and crumbled feta cheese together in the bowl with the beets. In a small separate bowl, whisk together lime juice, extra-virgin olive oil, and cracked pepper. Pour dressing over the top of the salad. 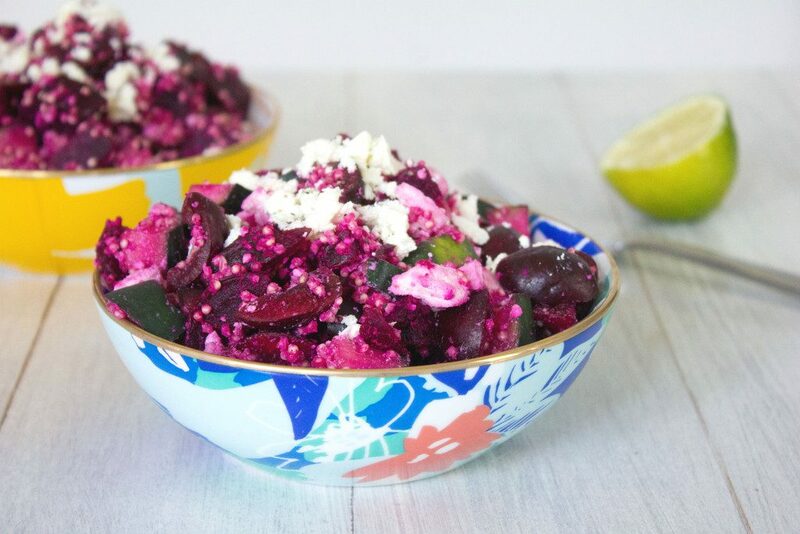 10 Responses to "Roasted Beet and Cherry Salad"
Looks awesome!, I’m gonna try it….. This beet salad was amazing! My husband doesn’t like beets, either! So, needless to say, we hardly ever eat them. But I’m loving this gorgeous salad, Sues! That color and flavor…yuuuum! Both hubby and I love beets and we have some in the fridge. What a delicious (& unique) combo with the cherries 🙂 Yum!! 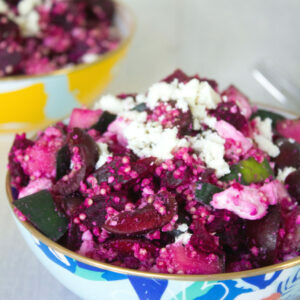 The color of this salad due to the beets is GORGEOUS! What a beautiful dish! So vibrant! 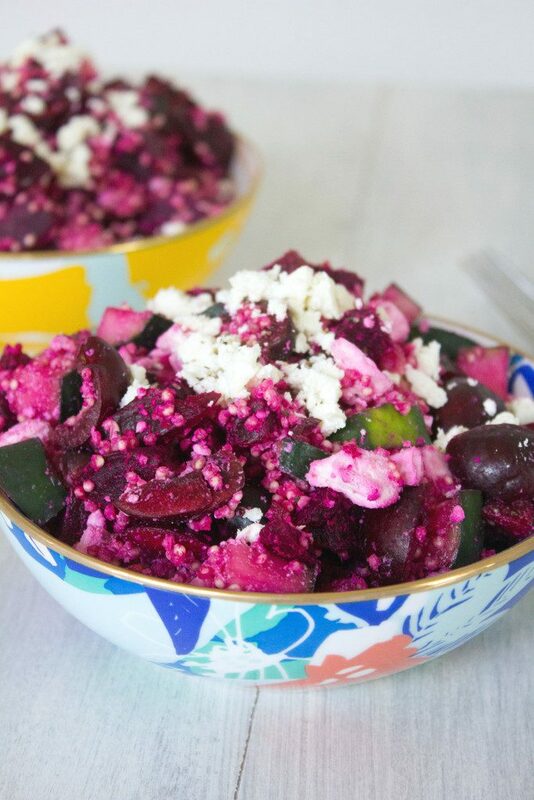 I am now becoming a lover of beets… this salad looks terrific. My husband actually LOVES beets. They are one of the few healthy things he likes. This is so pretty and looks like the perfect transition between seasons. Lol! I used to be exactly like you hubs! Seriously, I haaaaaated beets! But now I love them! Well, minus the fact that their color bleeds EVERYWHERE. Anyways, this salad is gorgeous, Sues! That color though! Gahhh sooooo pretty! I’ll take a vat! Cheers, dear! Wow how incredible are these colors! 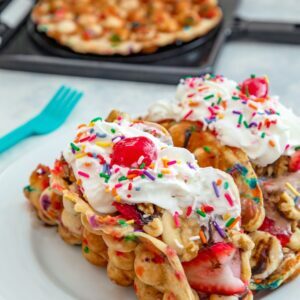 I’ll have to try this one! That is such a pretty salad! Love the idea and love roasted beets. 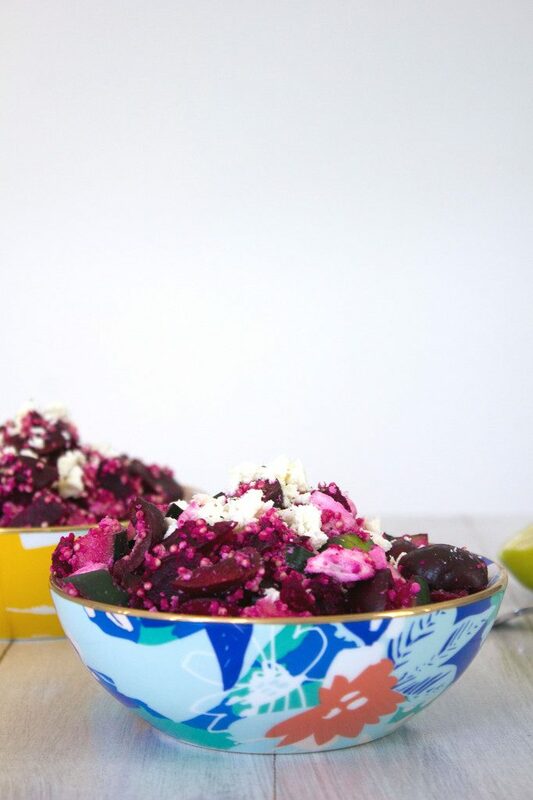 My daughter’s here and she’s a beet lover too….this is a must try for us!